Three coast guard vessels were on the scene Sunday night assessing the spill, the oceanic administration said. 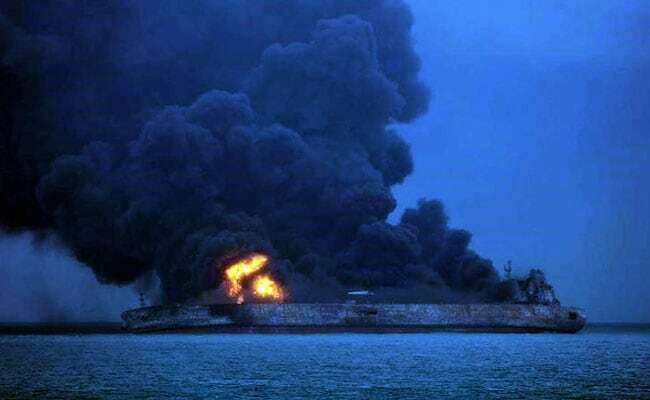 Beijing: The spill from a sunken Iranian tanker off China's east coast has more than trebled in size, just over a week after the ship sank in a ball of flames. Authorities spotted three oil slicks with a total surface area of 332 square kilometres (128 square miles), compared to 101 square kilometres reported on Wednesday, the State Oceanic Administration said in a statement late Sunday. The Sanchi, which was carrying 111,000 tonnes of light crude oil from Iran, collided with Hong Kong-registered bulk freighter the CF Crystal in early January, setting off a desperate race by authorities to search for survivors and stave off a massive environmental catastrophe. The amount was revised down from the original estimate of 136,000 tonnes, the Ministry of Transportation said Friday. The bodies of only three of the ship's 30 Iranian and two Bangladeshi crew members have been found. The type of condensate oil carried by the Sanchi does not form a traditional surface slick when spilt, but is nonetheless highly toxic to marine life and much harder to separate from water. The area where the ship went down is an important spawning ground for species like the swordtip squid and wintering ground for species like the yellow croaker fish and blue crab, among many others, according to Greenpeace. It is also on the migratory pathway of numerous marine mammals, such as humpback and grey whales. While the accident is unlikely to have a significant impact on the coastal ecology, it has already had an effect on marine life, said Liu Hongbin, a professor at Ocean University of China. "But, it is necessary to do more observation to know how big the concrete impact will be," Liu said. Wang Junding, a Chinese fisherman, told AFP that the spill is unlikely to have much effect on his industry, since "there aren't many fish there to begin with". In addition to the light crude oil, the Sanchi also carried a fuel tank able to accommodate some 1,000 tonnes of heavy diesel. If all of the Sanchi's cargo spills into the sea, it would be one of the biggest oil slicks from a ship in decades. By comparison, in the eighth-worst oil spill since the 1960s, the Sea Star dumped 115,000 tonnes in the Gulf of Oman in 1972, according to figures from the International Tanker Owners Pollution Federation website.